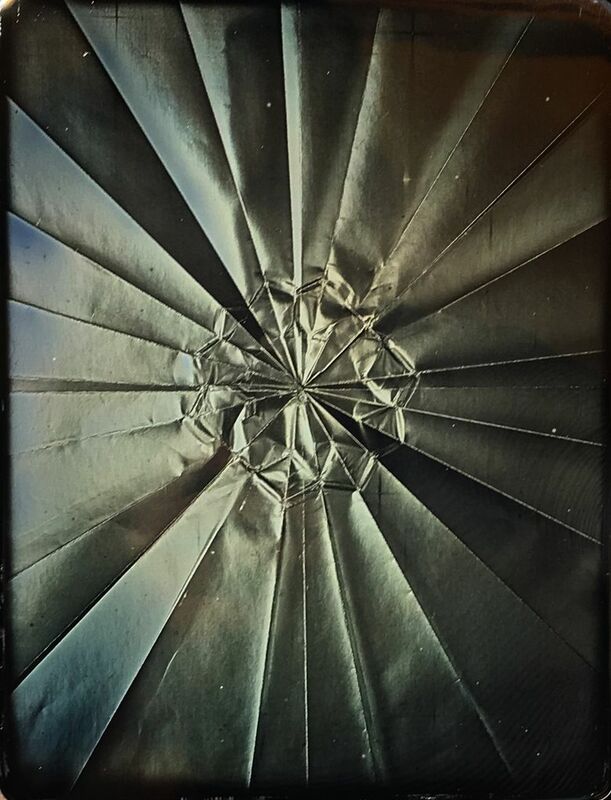 Photorealistic precision put to surreal use; paper origami seen in an oddly metallic light; scrap-metal sculpture that plumbs the riddles of the heart — these are a few of the experiments going on in Seattle art galleries this month. They’re also a ton of fun, thanks to Murrow’s knack for making the fantastical look plausible. You may not know what his loopy heroes are up to — but you know exactly how they’re doing it. In “Cutting the Waddle of the Pyrite,” a ranch hand (Murrow, in self-portrait) makes fine adjustments to a platform of small stacked planks on which a saguaro cactus is balanced. Ropes secure the cactus in place, as if to prepare it, absurdly, for a move. “Requisite Tutorial” brings things into the motor age. Murrow, lariat in hand, races across a desert landscape in some kind of dune buggy with a startled horse’s head mounted on its front. His object of pursuit: a flying car with the words “NO ONE” emblazoned on its side. CinemaScope-wide and crazed with velocity, it’s the ultimate action picture. In other drawings, Murrow crafts cunning illusions within illusions. That strange masked guitar player in “Ballad of the Ain’t Can’t,” for instance, turns out to be a drawing on a circus-tent flap. The most urgent reason to see “Cowboy” is “Tough Medicine,” a site-specific Sharpie wall drawing lampooning cowboy-and-Indian combat, with Murrow in the cowboy role. The proverb “Art is long, life is brief” doesn’t apply here. “Tough Medicine” will be painted over after “Cowboy” closes. 10 a.m.-5 p.m. Mondays-Saturdays through June 20, Winston Wächter Fine Art, 203 Dexter Ave. N., Seattle (206-652-5855 or winstonwachter.com). Paper airplanes and origami creatures undergo startling transformations in this collaborative show by photographers Eirik Johnson and Daniel Carrillo. In these daguerreotypes, children’s paper toys are spread flat and are abstracted into images of a strangely severe yet luminous quality. “Jewel” seems the right word for each piece in the show. The weight of the images is reflected in their titles: “Hammerhead,” “Silent Thunder,” “Eagle.” For works that are so purely abstract, they’re oddly full of personality. There’s something both meditative and mesmerizing about the way they play with line and contour as they pull you into their enigmatic depths. 11 a.m.-5:30 p.m. Wednesdays-Fridays, 11:30 a.m.-4 p.m. Saturdays, through June 3. G. Gibson Gallery, 104 W. Roy St., Seattle (206-587-4033 or ggibsongallery.com). It’s one thing to have a metaphorical heart of steel. It’s another to make a heart out of literal steel. Oregon artist Travis Pond takes all sorts of metal scraps — gears, screws, wrenches, silverware — and fashions a variety of valentine-shaped hearts from them. Sometimes his titles (“Spoons and Forks,” “My Tool Box”) acknowledge his working materials. In other cases (“Feathers,” “Wink”) they allude to illusions he’s creating with his unlikely components. In his most striking pieces, the literal and the metaphorical fuse seamlessly. 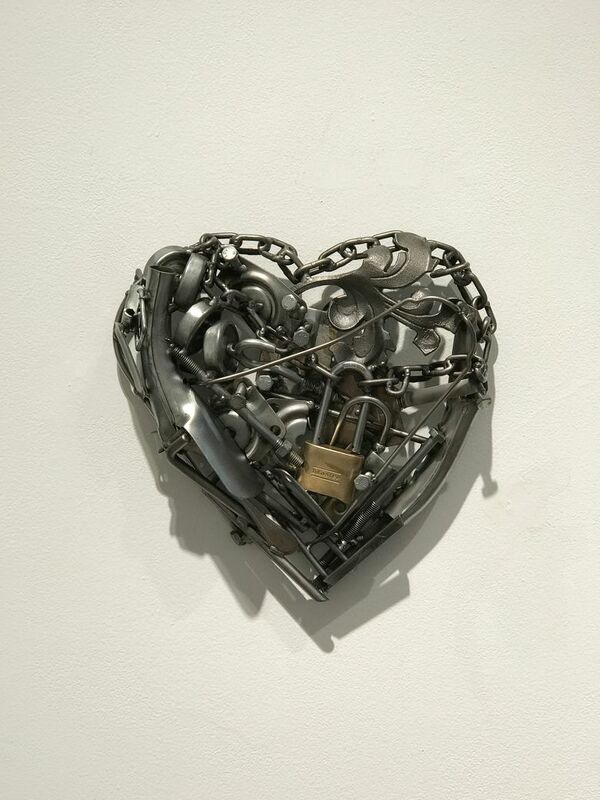 “Lock the Heart” has a padlock at the center of its metal miscellany. Far from gimmicky, it has a melancholy punch to it. Noon-5 p.m. Wednesdays-Saturdays through May 27. Bryan Ohno Gallery, 521 S. Main St., Seattle (206-459-6857 or bryanohno.com).